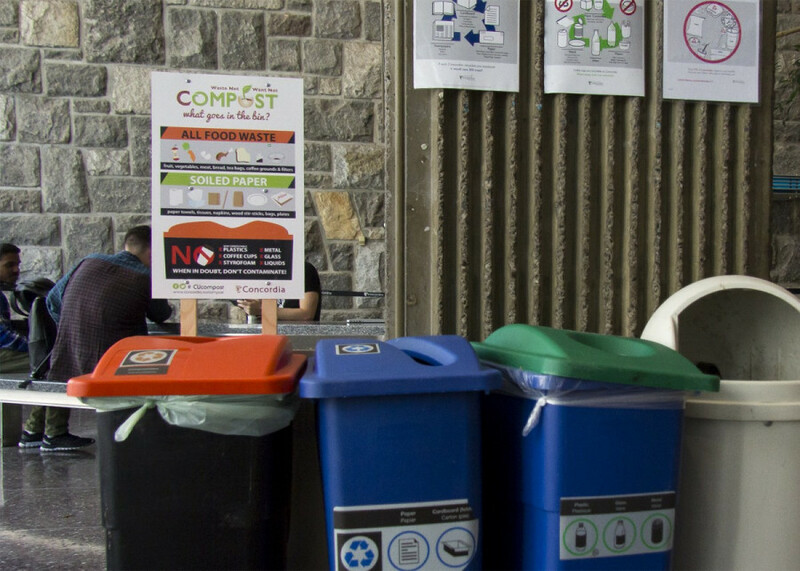 This September marks one year since the launch of Concordia’s Waste Not, Want Not project, which aims to educate people about composting. Although it had a successful first year, there are still obstacles to overcome. According to Keroles Riad, a PhD student and founding member of the project, it couldn’t exist without the university administration and staff’s cooperation. One of those staff members is Faisal Shennib, Environmental Coordinator at Concordia, who works on getting compost bins in place. These include the bins with orange lids found in 45 places throughout the university and the compost buckets found in a number of office kitchenettes. He is happy to help students with projects like Waste Not, Want Not, and he believes students are the best people to do it. “They have the knowledge, the vision, the passion and they’re not jaded by life,” Shennib said. Last year, the Waste Not, Want Not team held a number of events. They took place primarily in September to coincide with orientation and frosh events. Many of them will be repeated this year, and Riad said he plans to introduce even more. One of the projects that made it back on the roster for 2017 is the food festival. It featured kiosks from a number of Concordia-based groups and hosted about 1,500 people per day. The team will be hosting another one at the beginning of the winter semester, which they did not do last year. Waste Not, Want Not also brought back the one-sided notebooks made from recycled paper from both university campuses which they give to their volunteers and hand out at some of their events and booths. Some of the events and demonstrations held last year won’t be making a comeback for the 2017 school year. Included in these are the floor stickers which demonstrated the organic contents that end up in garbage cans and Riad’s personal favourite, a motorized compost-bin robot. New this year are videos which were made during the food festival and six roll-up banners which will be placed throughout the university’s two campuses. Riad also said there is definitely more to come, but nothing is confirmed yet. As far as adding compost bins around the university goes, the team always expects problems. “It’s never going to be perfect. There are going to be some bumps along the way. Our goal is to minimize them,” said Shennib. Shennib also said that he has seen an overall positive reaction and that when people are concerned, it is usually about the smell and possibility of pests. But, he said, communication is key. There have been some complaints about bins taking a long time to arrive when requested, and bins going missing from their designated spots. Riad said he understands why people are upset. “People are passionate about composting and with passion comes excitement and frustration,” he said. Riad also has his own frustrations. Because Concordia does not have a large-scale, on-site compost system, they have to ship their compost 140 kilometres away. As a result, 13 per cent of the emissions Concordia saves by composting are re-emitted in shipping. “This kind of re-emission is not acceptable,” Riad said. He would like to see on-site composting as well as a system throughout the university that automatically provides a compost bin to any event with food. The project can claim some good wins, with the university increasing its amount of composted material in the first year of Waste Not, Want Not by 40 per cent from the previous year. Moving forward, Waste Not, Want Not would like to continue increasing the amount of composted material, reducing the amount of organic matter going into the garbage and working towards getting an on-site compost system. The project recently merged with the Sustainability Ambassador Program, a program that gives students the opportunity to volunteer to help teach people around the university about sustainability issues. According to Riad, it has helped a lot with volunteer management. He said this will also help ensure the project can continue running even after he graduates.